The Miners of Wabana, by Gail (Hussey) Weir, describes in vivid detail the working lives of the Wabana miners as told in their own words. Their stories reveal their individual histories, challenges, resourcefulness, hopes, fears, superstitions, camaraderie and wonderful sense of humour. This book explores the conditions in the mines, the inevitable tragedies, what it was like working with the mine horses and alongside the ever-present rats. There are tales of heroes, ghosts and fairies. It also tells the history of the mines and the companies that ran them, the workers' unions, strikes, ferry and ore-boat sinkings in the Tickle, the eventual shut down of the mines, and the effect on the people of Bell Island. ​This 2006 edition is an update of the original 1989 edition. It features a summary of many of the literary and artistic works that have been produced since the mines closed in 1966, including the Murals Project of the 1990s, with details and photographs of each mural. As well, it highlights the monuments to the Island's history, including the Bell Island Community Museum and No. 2 Mine Tour. 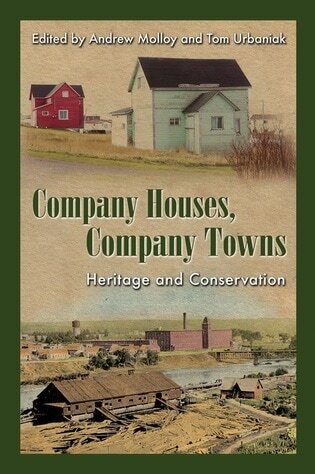 Company Houses, Company Towns: Heritage and Conservation is now available from Cape Breton University Press and Amazon.ca. The Kindle edition is available for download from Amazon.ca. Chapter 3, "Company Housing at Wabana Iron-Ore Mines, Bell Island, Newfoundland," is a history of the housing built by the Scotia and Dominion companies for their staff and miners, and the streets and neighbourhoods where they were built. It also tells the stories of some of the people who lived in those houses. The top photo on the book's cover is of two Dominion houses that were located at Dominion No. 1, Bell Island.